ElegantJ BI reimages business intelligence and augmented analytics with a different approach to data access, dependability, mobility and the user experience. ElegantJ BI is user-centric with a focus on business users and a foundation of self-serve tools to support user adoption with Advanced Data Discovery so users can quickly and easily prepare and analyze data, and visualize and explore data, notate and highlight data and share data with others. ElegantJ BI integration with SAP® – your popular enterprise application, provides organizations with ease of access to organizational data. Users can leverage the sophisticated, easy-to-use features of the ElegantJ BI suite to analyze data and produce reports and dashboards on their own without dependence on IT or analytical staff. 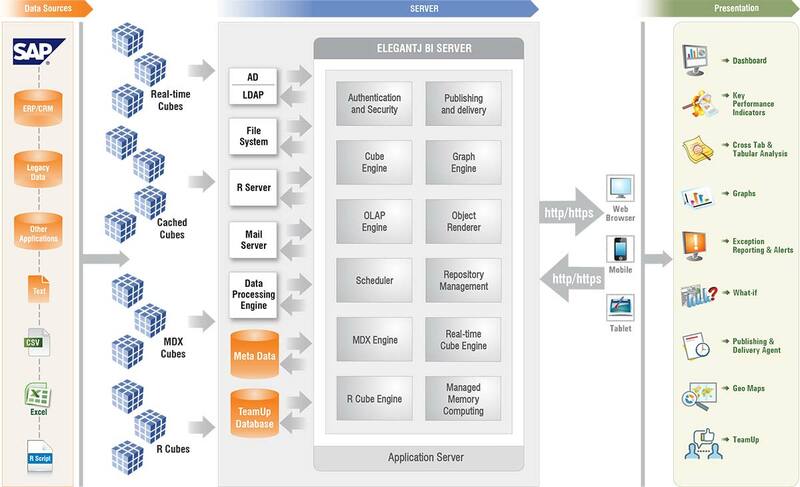 The ElegantJ BI connection to SAP is created by leveraging Business Application Programming Interface (BAPI) to access data within SAP. Users simply select a BAPI and then select from a list of columns available as output from that BAPI. Then they can consume this data with simple drag n’ drop functionality in a 100% browser based, self-serve interface. Organizations that have implemented SAP solutions can leverage familiar tools and expand usage of business intelligence and analytical tools throughout the organization to support hundreds or thousands of business users and democratize data analysis using ElegantJ BI features and SAP connectivity. Organizations can leverage the benefits and simplicity of ElegantJ BI and access enterprise data stored within the SAP solution. Access through the ElegantJ BI solution assumes enterprise understanding and compliance with SAP licensing terms and conditions. The ElegantJ BI connection to SAP is seamless and easy to use. Simply install the required BAPI on SAP, then start the ElegantJ BI SAP connection wizard from within the ElegantJ BI solution to connect to SAP. View and select a BAPI from a list of available BAPI and pass query parameters, then select columns and start building your dashboard or report in no time. It's that simple! If you need self-serve business intelligence tools and advanced analytics with flexible connections and seamless SAP integration, Contact Us today. We encourage technology and IT consulting firms to explore our valuable partnerships and discover the ways in which we can support your SAP customers. For more information, email us at sales@ElegantJBI.com.